I sat by the sea with a friend I met once and then followed around the world. We watched the waves crash on the sand, each lost in our own thoughts of how great Thou art and oh how He loves. “I love the ocean,” the traveler said, the sand of so many beaches and the souls of so many loved held in her words. “Mmm,” I said, my eyes on the horizon. “Me too.” In that moment, faced with the expanse of ocean arms reaching from shore to shore, from heart to heart, from here to there and back again, one phrase crashed, self upon self, in my mind as the waves on the sea: My life is so full. Full of sea breezes and salt in my hair. Full of two languages worth of love and adoration, forgiveness and gratitude. Full of one whole world’s worth of friends. Full of hopes and dreams and she’s worth more. Full of lessons being learned and taught, words shared and given and received and held close. Full of perfecto amor and has sido fiel. I sat by the sea with a friend I met once and then followed around the world and as I listened to her stories I recognized a beauty and a grace almost beyond knowing. Just as the sea only knows the waves, the tides, the pull, the crash of self upon self, I only know this beauty and this grace. The Father, the Son, the Spirit, the crash of self upon self. A beauty and a grace almost beyond knowing. But like the sea it offers itself up for the taking, if only to retreat quickly back to where I cannot follow. 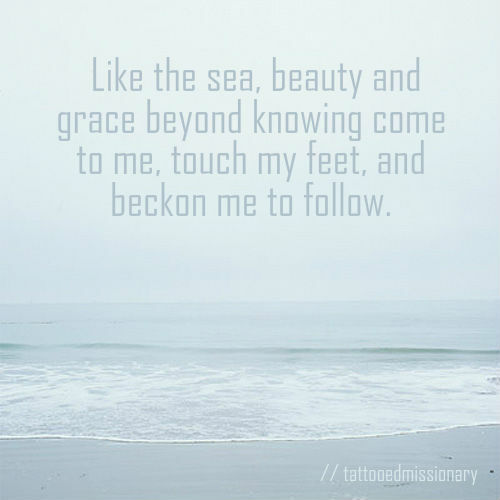 Like the sea, beauty and grace beyond knowing come to me, touch my feet, and beckon me to follow. And so I do what I cannot. I take my body, so full, and I follow the waves, the tides, the pull, the crash of self upon self, to where I cannot follow. I walk on the sea and in the sea and I become the sea and the sea becomes me. An eternal cycle of waves, tides, and pull. A holy knowing and being known. A crash of self upon self. This is so beautiful. There is indeed something about the sea that makes us reflect on life and feel grateful for everything, everything, the joys as well as the sorrows. Thank you. One of my favorite ways to spend a day is with my feet in the sand and my eyes on the sea. There’s something about the hugeness! And yet the consistency.